My real-life name is Carolyn but since I spend most of my time online these days I seem to be better known as Artform. I was born and bred in Scotland and still live there, about half way between the beautiful cities of Glasgow and Edinburgh. I worked as a research scientist up until 2007 when I lost my job because of health problems. That same year I met my fiance, an American from the state of Arkansas so I do quite a lot of travelling to visit him. At the moment we are trying to make a firm and final decision on which country to live in so that we can finally get started on the immigration visa process. Carolyn I began at Zazzle in February of 2010 almost by accident. I've always been artistic and my fiance is quite proud of that. He suggested selling t-shirts as a business idea and I began looking around online. Zazzle came up first in the search results and there you have it. 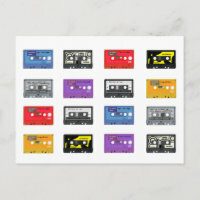 I'd previously sold some of my original artwork through eBay and it seemed amazing that with Zazzle I could resell it over and over again as prints. It didn't quite work out that way however as my "art" isn't amongs my best selling products and so I concentrate more on designing stationery and cartoons now. Carolyn My main store is ArtformTheHeart and it covers a wide variety of styles and subject matters. It started out with my artwork (paintings and drawings in pencils and pastels) and photography. It now has a rather large Wedding stationery section, sections for patriotic designs, photography, and lots of cartoons from "chicks" to kawaii to sports and holidays. Animatastic was my second store and it's dedicated entirely to cute cartoon animals. It's also my second best performing store. I started this out as an experiment with public domain clipart and I had it set up and filled with around 200 products within 24 hours to see if clipart would sell. As I say, it was a experiment because I wanted to know if it was worth my time creating original designs or if clipart would sell just as well. 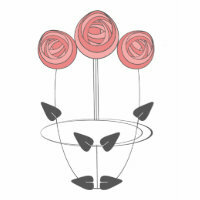 But since I enjoyed creating cartoons so much, I soon began adding my own animal creations and they took over the store! Tee Whiz is where I add designs that I'm not comfortable placing in my main store for one reason or another - either I don't think they are my best work, or I feel that they may offend people. Artform Nouveau began because I felt that I had too many designs in this style taking over my main store. Being from Scotland I have always loved and admired the work of Charles Rennie Mackintosh and that's a big influence on the style of this store. I actually got my first custom request via this store for Rennie Mackintosh Wedding stationery. The Stepmom Project came about because my fiance has 3 sons and despite the fact that I'm not very maternal at all it became clear early on that I was indeed going to become a Stepmom. I don't spend a great deal of time working on this store but it has it's own moderate success. The designs are almost all family oriented (not exclusively stepfamilies). Made in the USA was a store that I set up supposedly for my fiance. He has a lot of great ideas and I wanted to make zazzle something that we had in common. It didn't work out that way however and this store has been badly neglected! I have one other store that isn't linked to the others, but for now I'd prefer to keep it as anonymous as possible (though there is a trail that I'm sure people could follow to find out what the store is, lol). Carolyn Wow, that's a difficult question Jasmine! I sell a lot of variations of one design, or one design on lots of different product types. I get a lot of custom requests from this design for specific tartans and customers love it because it can easily be made to incorporate two different tartans - one for the Bride's family and the other for the Groom's family. What customers also like is that I can recreate any tartan for them - even ones that aren't readily available in databases. My most recent request for a bespoke design involved me creating one of the tartans from scratch in my graphics software and and also making a version of the family crest to go with it. After I finished making the pony cartoon, I was a little worried that it looked a little too similar to a My Little Pony toy I had as a child so I contacted Hasbro for clearance before adding it to any products. It also sold 200 copies on greetings cards from one of the stores. 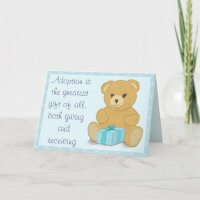 I have sold a lot of this Adoption Greetings card in both the boy (blue) and girl (pink) versions, strangely almost all to the UK, whilst most of my other sales are to the USA. Carolyn Right now I don't. I've always been a hard worker and really push myself. Living on my own at the moment, there's no-one to force me to take breaks, so I don't. When my fiance is around I do my best to stick to 9-5 hours although I am sure that he would disagree with that. Carolyn When I joined Zazzle I had no clue about selling online other than via eBay. I didn't visit the forum at all for the first three months and did no promoting at all. My descriptions and keywords for my products were all a mess too. Because of all that, it took me 8 months to meet the ProSeller, just as they put the program on hold. So it took 17 months for me to officially get the ProSeller status but I did jump straight in at the bronze level. Visit the forum every day. I can't stress enough how valuable the forum is. From advice and tips for new zazzlers, to important updates and news about the site, maintenance and new product releases, promotion opportunities, networking; it really is a very rich resource. Make sure that your designs fit your products - and I mean both physically and aesthetically. Don't use the Quick create tool to plop an image onto every product available unless you intend to edit each one to resize if necessary. And please don't put offensive or PG/R rated designs onto baby or children's t-shirt, it makes us all look bad in the eyes of the customer. Promote, promote and then promote some more. Your products won't sell if no-one sees them. Really liked the interview. I remember when Artform started popping up in the forum and see now that she started on Zazzle the year after I did, same month even. Wow it sure didn't take her long to excel! I've got a lot of catching up to do :). Thanks for the inspiration! Thank you so much for this article. I'm a beginner at Zazzle so this was very inspiring! You are amazing, in so many ways. You move me, like nobody can. Your determination to succeed, is so obviously noticed. Your Scottish roots are easy to see. And, on the inside...You are the best thing to walk into my life. I will love you till the end of time, and even further.